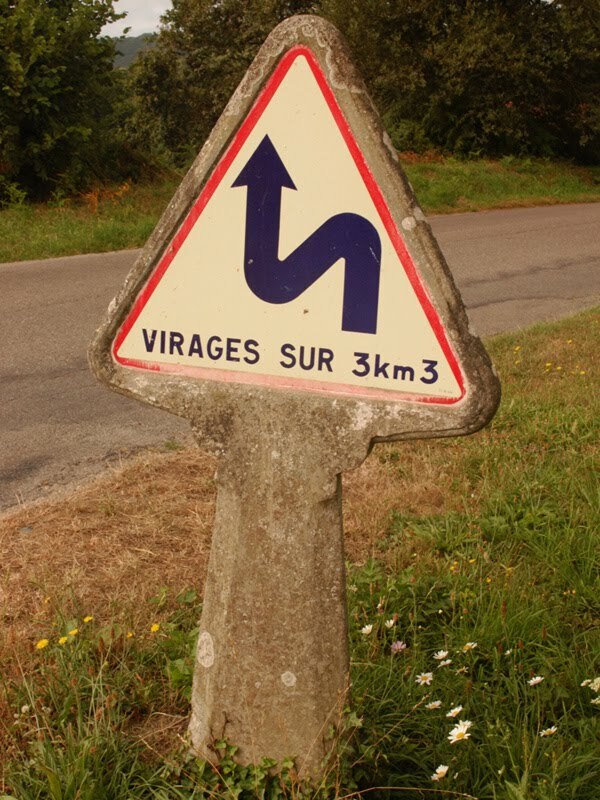 French road sign warns of curves ahead. Photo from photoguide.cz. ...you will often find yourself passing through villages where the road shrinks to one lane to be shared with pedestrians, bicycles, dogs, restaurant sign boards, and oncoming traffic. PARIS -- When making comparisons between France and the United States, I typically favor France, but not always. France has no Grand Canyon or redwoods. No buffalo or buzzards. The French make a virtue out of force feeding geese, love nuclear power, eat horses, smoke cigarettes too much and pot not enough. Other exceptions escape me. I was first infected with Francophilia thanks to the U.S. Army, which in 1964 very kindly sent me to France rather than Vietnam. Two months before the Gulf of Tonkin incident, which signaled the beginning of the U.S. assumption of the principal fighting role in Vietnam, I arrived at a major headquarters unit in Orleans, France, to begin my career as an army clerical worker. It was a nice, clean job in a non-combat zone, the very definition of soft duty. Although unaware at the time, I had lucked out beyond my wildest dreams. Orleans is just upstream from the famed chateau region of the Loire Valley and an hour south of Paris. Although I complained about it for the next two and a half years, it beat being anywhere near Vietnam, or Germany for that matter, by considerably more than a country mile. Only much later did I realize it was a seminal time for me. Besides our regular army jobs, we were required to do extra duty about once a week, usually struggling to stay awake while "guarding" some empty office building through the night. I volunteered to be a "duty driver" instead. This only meant that I might have to wake up in the middle of the night to drive some drunk lieutenant home from the officer's club. It was my first experience driving in France. I have since driven through France several times and have concluded that there are several features of the French road system that are clearly superior to that in the U.S. -- and a couple that are not. Although the French are not typically defensive drivers, France has about 40% fewer traffic fatalities per capita than the U.S.
Clearly, they have something positive going for them in this sphere. It is not that they are better drivers or have safer cars. More likely this commendable safety record is due to the traffic system design. American expatriate friends who have lived in France for many years say that it is also due to a cultural undercurrent of patience and civility. This latter opinion flies in the face of the common American stereotype that the French are rude. I believe this stereotype is pure crap. France is the world's most popular tourist attraction and an important component of that is its citizens being gracious hosts. I've seen Americans in France berating waiters for not speaking English far more often than French waiters being rude to American customers. Virtually every day French people volunteer to speak their limited English to me even though I'm in their country and speak rudimentary French. Americans who say the French are rude are almost invariably bigoted chauvinists who have never been here. If they have, they probably came on a guided tour with preconceived prejudices and lacked the willingness or ability to speak a word of French. Try to imagine a Frenchman at Denny's insisting on a French-speaking waiter. Yet that's the kind of expectation such Americans have. 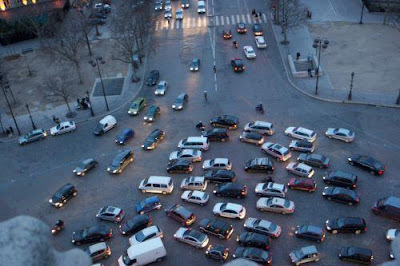 View of traffic circle below the Arc-de-Triomphe. Photo from travelpod.com. The most noticeable difference in the road system is traffic circles. They are rare in the U.S. but very common in France, especially outside city centers. They replace stop signs and red lights and keep traffic continuously moving. On entering them, you must yield to cars already on them, but usually everything just keeps flowing. One can pass through even medium sized towns without ever stopping, having gone through several circles in the process. Each circle has clearly marked directional options, both road numbers and towns to be found in the direction indicated. You just need to know the next major town in the direction you want to go and it will appear on a sign pointing to the correct road. If you are uncertain where you're going, you can keep circling until you decide. French drivers, however, are quick to observe this indecisiveness and may honk, gesture and mouth unintelligible remarks. This is especially true if you have an Avis sticker on your back window. To the American driver, the main negative feature of these circles is that they have two lanes going around them and often two lanes entering them. This sometimes calls for a certain amount of maneuvering. The maneuver where a car on the inside (left) lane of the circle suddenly realizes it is time to exit right is troublesome to Americans used to precise rules of the road. To the French, however, it is an event that calls forth the efficacious driving principle in which rigid rules that breed complacency and displace personal responsibility to external institutions are replaced by individual initiative and mutual negotiations. This mix of freedom, caution, and cooperation enables traffic circles to work well. The French readiness to communicate with other drivers is subtly different from that which typically takes place in the U.S. In the U.S, most people are reticent to express their displeasure with other drivers because the recipient of their remarks may be heavily armed and have an easily offended masculinity. This potential for serious road rage is practically non-existent in France. For the French -- not having the God-given right to possess deadly force at all times -- expressing such displeasure isn't all that risky, so people feel more free to indulge. But these exchanges are a kind of banter with a core of politeness or at least civility. The French have even been known to apologize. If you think they're saying something nasty, it's probably because you're paranoid and don't understand idiomatic French. The signage on French roads, unlike that in the U.S., utilizes international symbols. It is in most respects better, at least insofar as telling you where you are going. The signs can, however, be ambiguous, especially for someone unaccustomed to the international signage and who doesn't read French. It helps to have a navigator with a translation dictionary. Another complication is that the numbers used refer to the metric system. Of course, anyone familiar with both the metric system and the confusing jumble of measurements we use in the U.S. will attest to the superiority and greater simplicity of the former. But it does take getting used to. 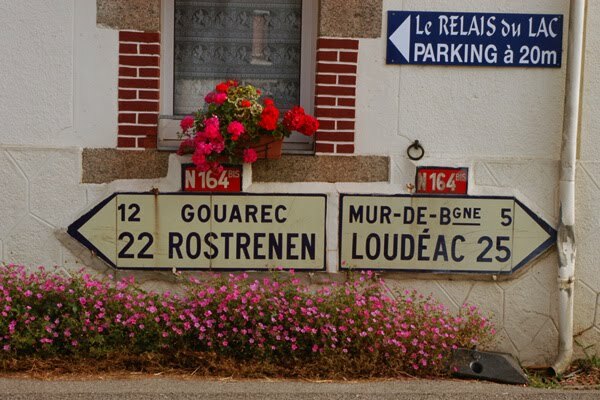 French road signs on the side of a house. Photo from photoguide.cz. Another feature of French signs that Americans may find bothersome is that they never refer to cardinal directions. There is no highway D15 east and D15 west; only D15. This may be due to D15 winding in several directions as it circumvents some town. We carry a compass. Another clearly superior feature of the French road system is that large trucks are always obliged to go slower than cars, in some cases much slower. On super highways outside cities cars can go up to130km per hour while trucks are limited to 90. This confines trucks to the right hand lane. It also allows tourists who don't know where they are going to nestle among them until they figure it out. On smaller departmental roads, the difference is usually 90 and 80. The maximum speed a truck may go is shown by numbers on its back door. Imagine I-35 in Austin with no semis blazing along at 80mph. And due to reliance on a much better developed rail system for the movement of goods, there are many fewer trucks to deal with. On French roads the speed limits change automatically when it rains. On super highways, it drops from 130kph to 110 for cars and 90 to 80 for trucks. Corresponding changes are required on smaller roads. Although I've never seen it, I have heard that this exists in the U.S., but varies from place to place and is poorly enforced. However, speed limits are seldom posted on secondary roads except to slow you down when passing through towns. The maximum speeds are uniform for all roads of a certain type and you're supposed to know what they are without being told. On a D (departmental) road, it's 90kph on dry roads, dropping to 80 if it's raining. But no sign will remind you of this. Traffic scene. Photo by nealiousq1 / webshots. If you learned to drive in France, you were required to know maximum speeds for different types of roads under different conditions. Tourists have to figure it out by other means and it's best to do so quickly because French police, when they make one of their rare appearances on highways, will give you a ticket for the slightest transgression of the prescribed limit. Another outstanding feature is the "passage." These are pedestrian cross walks, a series of white rectangles painted across streets in urban areas. They are very common, not only at corners, and vehicles must stop for pedestrians who are in them. They often do so even for pedestrians near one, when they even look like they might be thinking about crossing. This is especially true for anyone using a cane or pushing a baby carriage. These events must be anticipated. The question often arises as to who got there first, but the pedestrian has the priority in this game. The driver behind a driver who is about to brake for a pedestrian also must be prepared to act suddenly. Strolling tourists not from California are often timorous about exerting this right, but the French seem to feel confident hurling themselves into the "passage " without looking or breaking stride. assumption of individual car use. Imagine no cars. For many French it isn't hard to do. Living in compact towns and cities laid out long before the advent of cars, they can walk to nearby stores for all their needs. This has added benefits in terms of reducing pollution, promoting health, and maintaining small enterprises and social integration. There are many more bicyclists in France, some doing mundane tasks and others out getting exercise. Many older men seem to be preparing for another run at the Tour de France. Bicycles rarely have special lanes and you are actually expected to defer to them. A pair of French landmarks. 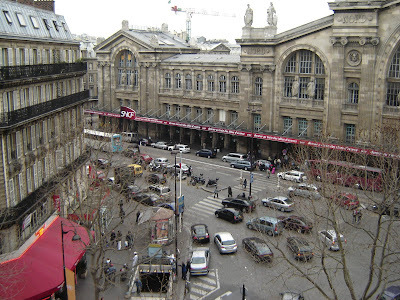 Besides these alternatives to driving, France has a vastly better developed system of public transportation. The train system, owned by the government, is especially good. Trains go to even very small towns. We stayed in a town of no more than two thousand, but it had frequent train service to the nearest city and from there to the entire country. Given the paucity of train service in the U.S., killed off early in the 20th century by car manufacturers and oil companies, I would speculate that the French ride trains a thousand times more per capita than Americans. 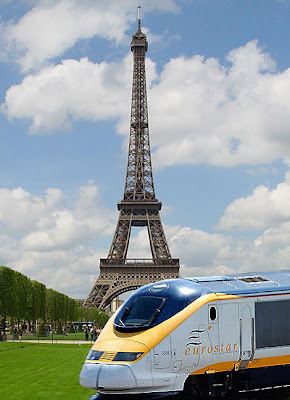 The trains that run between major cities are now all TGV's, high speed trains that run close to 200mph. Paris to Marsailles can be as little as a few hours. As the train stations are near the city centers, trains are typically quicker from home to ultimate destination than if you flew. In Paris especially, few people get around by car. It's not practical. There isn't room for them, especially parking places, and municipal authorities look down on their use. This attitude is the opposite of what you find in the U.S, where space for cars is sacrosanct. 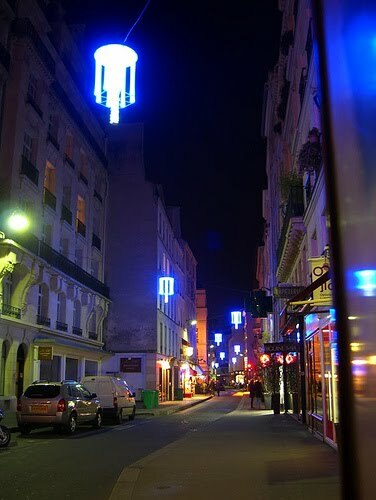 In urban France, parking garages are kept out of sight; they are underground and tourists are reluctant to drive down the dark holes leading to them. If you can by some miracle find an above ground parking spot, be ready to spend real money to rent it. There won't be a parking meter for each space, but on the coveted site "payant" will be written. This means you must find the nearby machine dispensing permits, insert the correct change, take the paper permit it gives you indicating how long you have, and put it in a clearly visible place on your dashboard. This may run you a couple of euro an hour with a two hour limit. If you get a parking ticket and ignore it, you will get a large bill in the mail, even in the US. If you ignore that too, good luck renting a car next time you come to Europe. Alternatives to using a car in Paris or within other French cities are many. Besides walking and personal bikes, there is an extensive and well organized metro system that is directly connected to a regional train system that takes you far out into the suburbs. There is an even more extensive bus system that uses the same tickets as the metro and provides you with a view, but moves more slowly. For still more leisurely albeit costly transportation there is the "batobus," a large public boat covered with clear plastic canopies that runs up and down the Seine through scenic central Paris. Public bicycle installation. Photo by Graham Coreil-Allen / GPS. The latest transportation innovation is the public bicycles that can be found at installations all over Paris. You simply put a credit card into the machine found at each bike station as a deposit to get into the system. Then you can take out a bike for 30 minutes free and for very little thereafter, leaving it at any other bike station in the city. 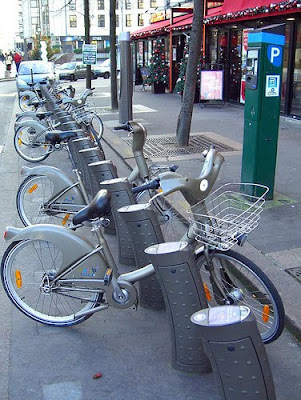 These are three speed bikes, but most of Paris is pretty flat. By these and other means, such as reducing the number of parking spots and lanes for cars, the municipal government is openly and successfully reducing car use within the city. The result of all these alternatives is that for urban dwellers cars are secondary transportation, a luxury used for special occasions. In contrast, life in the U.S. has been organized in such a way as to make car ownership an absolute necessity, the primary if not the only form of transportation. But what about the negative features of driving in France? There are only a couple that seriously bother me. One is that they don't tell you how much to slow down for corners on rural roads. You'll be on a D (departmental) road where the top speed limit is 90kph and approaching a curve. Nothing says to slow down. There may be blue and silver chevrons pointing in the direction of the curve to warn you, but no sign advises you about the safe speed. This reflects a gymkhana mentality. You clearly can't make that corner at 90kph unless you're a professional race car driver in a formula one vehicle. How fast you can actually do it depends on your car, skill, and nerve. A similar system in the U.S. would produce an epidemic of rollovers. In France, it's a matter of personal responsibility. Another major problem on French roads is motorcycles. The rules that apply to cars don't seem to apply to them. They totally ignore the speed limits, pass at any time and anywhere, park arbitrarily, and often travel in packs that seem to be racing one another for high stakes. Like on California freeways, they drive down the stripes between car lanes at a very high rate of speed, flying by while you're limited to stop and go. The difference is that because of high gas prices there are exponentially more of them in France. If you suddenly change lanes without noticing their very rapid approach, bad news. A willingness to constantly risk death seems to be a basic qualification for motorcycle ownership. You would think that the French highway patrol would clamp down on this, but there are very few of them, a fact that has other advantages. Holiday streetscape. Photo by Graham Coreil-Allen / GP. The French have a different concept of social space that is much closer and includes the way they drive. Their houses and cars are generally smaller. They stand closer to talk to one another. And they are quite comfortable driving much closer to other cars. If you are a tourist trying to drive leisurely through the countryside, this means that one is very often two feet off your rear bumper and looking impatient. The solution is to merely pull over. On narrow roads, we do it every few kilometers. This closeness includes the spatial geography of towns and cities. Virtually all of them came into existence centuries before cars and have not been significantly rebuilt to accommodate them. If you choose to get up close and personal with France by driving across it on secondary and tertiary roads, you will often find yourself passing through villages where the road shrinks to one lane to be shared with pedestrians, bicycles, dogs, restaurant sign boards, and oncoming traffic. Cars belonging to visitors are often not allowed in these villages. You are required to park on the periphery and walk in. Signs confront you saying "interdit sauf riverains," forbidden except for locals. Other signs inform you about who has the right of way when confronting oncoming traffic on a particularly narrow stretch. These places were not designed with cars in mind, and they now seem to make only minimal compromises. This contrasts sharply with the post-car lay out of American urban geography and our exaltation of the rights of these machines. 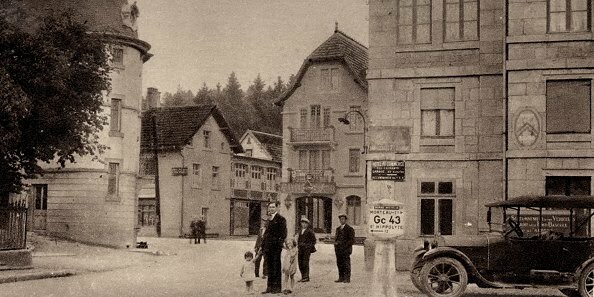 Vintage shot of Doubs, Miche (ca. 1930). Not built with cars in mind. Photo from photoguide.cz. Finally, a major difference between driving in France and the U.S. is that it costs significantly more in France. These greater costs are a result of much higher gas prices due to taxes. Gas is now above $7 a gallon and there are also lots of tolls on superhighways outside cities. The French are OK with this because they understand that the money goes into the road system, just as they are OK with higher taxes in general because they get meaningful benefits for their tax money, not just transfer payments to corporations like in the US. Given the other transportation options, driving long distances is seen as a luxury. Even the argument that you can pack a whole family in one car doesn't hold water. The train guys, government employees, have thought of that and offer family based pricing. You can buy a Carte Enfant + card that gets you 50% off for that child and anyone who travels with him or her. Americans would puke at similar gas prices and tolls because they see "free" roads as a right and don't take into account all the related costs. If you think that the road system in the U.S. is the best in the world, you're wrong. Having a passport to go with your driver's license might enlighten you. But few American tourists venture out on French roads, especially the back roads. As a result, they miss many of the best sights. There are many features of European roads that could be easily adopted that would save thousands of lives in the U.S. every year. Requiring large trucks to go significantly slower than cars and automatically reducing speed limits when it rains would cost practically nothing. But, these reforms are so very seldom discussed that few Americans are even aware of them. The trucking industry and its corporate clients find improving your safety costly and inconvenient. In the U.S. where corporations rule, reducing traffic fatalities has little measurable impact on the only thing that really matters: the bottom line. Such concerns are therefore a very low priority. Vastly expanding public transportation would shift the whole picture, saving thousands of lives, reducing oil consumption, and improving the environment. But expanding the public sphere is heresy in capitalist America, so don't hold your breath for these obvious reforms to take place. Only a few posts now show on a page, due to Blogger pagination changes beyond our control. Please click on 'Older Posts' to continue reading The Rag Blog. The Rag Blog is a reader-supported newsmagazine produced by activist journalists committed to progressive social change. The Rag Blog is published by the New Journalism Project, a 501(c)(3) Texas non-profit. by People's History in Texas. The Rag Blog and Rag Radio are a digital-era rebirth of The Rag. Get our weekly digest and Rag Radio updates free! Just click on the button below. Click here to subscribe to RSS feeds for the Rag Blog. Comment Policy: This blog enforces a specific comment policy that prohibits personal attack, goading and harassment, and other malicious remarks. We will delete remarks considered inappropriate, at the discretion of the editors. We will also delete all commercial solicitations. Tom Hayden : Progressive Dems See Opening for New Politics by Tom Hayden / The Rag Blog. The sight of progressive Democrats shaming and exposing the Wall Street-funded "Third Way" Democrats is a sign of a powerful new opening for progressives on the American political spectrum. Jack A. Smith : Climate Change Confab Brings Too Little Too Late by Jack A. Smith / The Rag Blog. The sharply increasing scientific indicators of impending disastrous global climate change have failed to motivate the principal developed countries to accelerate the lackluster pace of their efforts to reduce greenhouse gas emissions. Lamar W. Hankins : Opportunist Narvaiz Takes On Doggett Again in Gerrymandered 35th by Lamar W. Hankins / The Rag Blog. Former San Marcos mayor Susan Narvaiz, who is again challenging U.S. Rep. Lloyd Doggett in Texas' gerrymandered 35th district, is a political chameleon who says what she needs to say to protect herself from political accountability. Steve Horn : Keystone XL's Houston 'Fork in the Road' by Steve Horn / DeSmogBlog. The southern half of TransCanada's Keystone XL tar sands pipeline includes a "Houston Lateral Pipeline" that is leading the LyondellBasell refinery to retool itself for the looming feast of tar sands crude and fracked oil bounty. 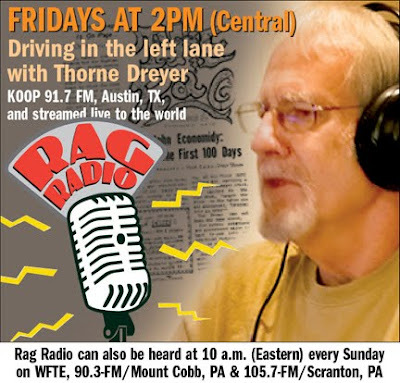 RAG RADIO / Thorne Dreyer : November Guests Include Spiritual Counselor, Citizens' Advocate, Singer-Songwriter by Rag Radio / The Rag Blog. Thorne Dreyer's guests in November included a Methodist minister and longtime social activist, a noted citizens' advocate, two staffers from the original Rag, the author of a book about the 'movement that started the civil rights movement,' and an acclaimed singer-songwriter. Listen to the podcasts here. BOOKS / Alan Wieder : Paul Buhle's 'Radical Jesus: A Graphic History of Faith' by Alan Wieder / The Rag Blog. Noted historian Paul Buhle, who has published an acclaimed series of nonfiction comics, is one of the most prolific and insightful critics from the American left. "Radical Jesus," which communicates the social message of Jesus Christ in comic format, investigates the inequalities that exist in the world through a theological lens. Rabbi Arthur Waskow : Israel, Hillel, and Idolatry by Rabbi Arthur Waskow / The Rag Blog. Hillel International, the "home" for many Jewish college students of diverse backgrounds and beliefs, has been beset with controversy about when uncritical support among American Jews for Israel becomes "idolatry of the State." Paul Krassner : Is There a Doctor in the House? by Paul Krassner / The Rag Blog. The Coachella Valley in Southern California hosted a massive four-day health clinic that helped more than 2,500 uninsured patients. Krassner points out that California leads the nation in people without health insurance and says that "the insurance industry has a preexisting condition known in technical terminology as greed." Kate Braun : Winter Solstice Falls on Saturn's Day by Kate Braun / The Rag Blog. Our celebrations during the Winter Solstice take from many traditions, including the Roman Saturnalia, Druid customs, the German "Yule," and the birth of Jesus; and it was Queen Victoria who popularized the lighted Christmas tree. Allen Young : Ralph Dungan, the 'Good Liberal' by Allen Young / The Rag Blog. A recent obituary of Ralph Dungan, one of President John F. Kennedy's top aides who later served as ambassador to Chile, reminds Allen of a revealing experience he had with the man referred to by a historian as a "good liberal." Ed Felien : A Good [Angry White] Man With a Gun by Ed Felien / The Rag Blog. Paul Anthony Ciancia considered himself a "good man with a gun" -- a warrior against the traitors who were taking over our government, bankrupting our currency, and trying to establish a New World Order -- when he walked into the Los Angeles airport and opened fire with an assault rifle. BOOKS / Ron Jacobs : Matt Hern Writes With Bravado That Sports Do Matter by Ron Jacobs / The Rag Blog. Engagingly written, Matt Hern's "One Game at a Time" is motivated by the belief that sports do matter as much as sports fans think they do. Hern, like leftist sportswriter Dave Zirin, "walks into the terrain where sports and politics mesh." Lamar W. Hankins : Right-Wing Rants and the Abominable Straw Man by Lamar W. Hankins / The Rag Blog. The Internet is a marvelous tool when used honestly and correctly, and with recognition of its limitations. But it is also home to angry rants, often from the far right, that make ridiculous claims -- like the one (that actually originated on a satirical site) saying that the Obama administration was setting up gasoline stations to provide free gas to low-income [read: black] people. HISTORY / Bob Feldman : A People's History of Egypt, Part 12, Section 1, 1947-1948 by Bob Feldman / The Rag Blog. More in Bob's series on the continuing movement to democratize Egypt, this time covering the period from 1947-48 when an anti-imperialist left made experienced growth -- and the Muslim Brotherhood collaborated with the Egyptian regime. Harry Targ : My Nelson Mandela by Harry Targ / The Rag Blog. An irony of 21st century historical discourse is how real historic figures -- like the late Nelson Mandela -- get lionized, sanitized, and redefined as defenders of the ongoing order rather than activists who committed their lives to revolutionary change. Michael James : Back to Uptown, 1965-1966 by Michael James / The Rag Blog. Mike continues his remarkable memoir, accompanied -- and inspired by -- photos from his upcoming book. His adventures -- and the making of an activist -- continue as he heads back to Uptown Chicago, "progressing along my path with another left turn and a big step into America." Alan Waldman : ‘Last of the Summer Wine’ Has Kept Millions Laughing for 37 Years by Alan Waldman / The Rag Blog. British national treasure, Roy Clarke, created and wrote all 295 episodes of this droll Britcom about three elderly Yorkshiremen with too much time on their hands. Alice Embree : Chile and the Politics of Memory by Alice Embree / The Rag Blog. Chileans went to the polls Sunday and appear to be reelecting Socialist president Michelle Bachelet on the 40th anniversary of the bloody U.S.-supported coup against Socialist president Salvador Allende. Alice writes about the dramatic contradictions in Chilean politics and history. Paul Krassner : A Tale of Two Alternative Media Conferences by Paul Krassner / The Rag Blog. Paul remembers the original Alternative Media Conference in June 1970 at Goddard College in Vermont -- and it was a wild and wooly affair headlined by the likes of Ram Dass, Harvey Kurtzman, and Art Spiegelman -- as the college hosts another conference keynoted by progressive radio host Thom Hartmann. RAG RADIO / Thorne Dreyer : Singer-Songwriter Slaid Cleaves in Interview and Performance Interview by Thorne Dreyer / Rag Radio. Acclaimed musician Cleaves talks about Woody Guthrie's influence on his work, reflects on his time as a busker on the streets of Ireland, and spins some yarns. He also performs live for our audience. Read the story and listen to the podcast. Harry Targ : STEM and the Tyranny of the Meme by Harry Targ / The Rag Blog. From the fear of "falling behind the Soviets" to the missile gap and, more recently the wars on drugs and terrorism, the fear of falling behind some fictional adversaries is an ongoing "meme" used by economic, political, and military elites. The latest? Now it's the "STEM crisis" and the fear that we're falling behind other nations in science and technology . Alice Embree : Anne Lewis' New Website Brings Austin Movement History to Life by Alice Embree / The Rag Blog. Noted documentary filmmaker Anne Lewis has created a website called Austin Beloved Community that uses audio, film, photos, maps, and personal recollections to create a "digital collage" about the struggle for social and economic justice in Austin from the 1880s to the present. Alice interviews Lewis about the unique project. BOOKS / Ron Jacobs : Marc Myers Tells Us 'Why Jazz Happened' by Ron Jacobs / The Rag Blog. Ron reviews a new book on America's own music in which Marc Myers "provides the reader with a deep, rich, and broad perspective on the confluence of jazz and U.S. history in the decades following World War Two." INTERVIEW / Jonah Raskin : Novelist Beverly Gologorsky Was Shaped by Sixties, Feminism, and The Bronx by Jonah Raskin / The Rag Blog. Another unique interview from Jonah with novelist Beverly Gologorsky, whose latest book, "Stop Here," "the title of which nearly shouts its presence. Gologorsky, "a novelist shaped by the New Left," edited anti-war publications Viet-Report and Leviathan in the '60s and '70s. Bob Feldman : A People's History of Egypt, Part 11, Section 2 by Bob Feldman / The Rag Blog. The latest in Feldman's series on the "movement to democratize Egypt" covers the period of 1945-6 when Egyptian communist and labor grew and faced government retaliation. David McReynolds : We Are All Wounded Veterans by David McReynolds / The Rag Blog. Long-time pacifist writer and activist McReynolds says there's something "infinitely sad" about the recent celebration of Veterans Day. "In the bad wars -- which are the only wars we have fought for some time now -- there is the terrible knowledge that the enemy was never really the enemy," he says. RAG RADIO / Thorne Dreyer : October Interviews with Poppy Northcutt, Maneesha James, Seth Holmes, and Thomas Zigal Interviews by Thorne Dreyer / Rag Radio. In October Rag Radio guests addressed Texas feminist history, issues involving death and dying, the plight of migrant farmworkers, and the post-Katrina craziness captured in fiction. Read about our guests and listen to the podcasts here. Michael James : Going Off Campus, 1965 by Michael James / The Rag Blog. Mike continues to share experiences and images from his rich history as an activist and adventurer -- that will be published in an upcoming book, "Michael Gaylord James' Pictures from the Long Haul." Here Mike reports on the Free Speech Movement at Berkeley, community organizing in Oakland, and his travels across the country in a 1957 Plymouth station wagon "drive-away." Alan Waldman: 'Keeping Up Appearances' Tops Second Tier of My Favorite Britcoms by Alan Waldman / The Rag Blog. Waldman has been reviewing vintage, mostly-British television series now available on DVD, Netflix, and YouTube. "Keeping Up Appearances" "is a very funny sitcom with a brilliant cast," starring Patricia Routledge as social-climbing snob Hyacinth Bucket. Charlie Loving : Ciudad Acuña on Life Support? Marc Estrin : Wagner -- Oi! Capping Corporate Liability : Who Pays the Piper? Jena, Louisiana : Drug Bust or Racist Revenge? Kagan and Obama : Birds of a Feather? Ray Reece : Where's the Outrage? Marc Estrin : M'aidez! M'aidez!